Okay, it's time for a confession. I started my relationship with hummus last year. I have never been a big fan of beans, so I stayed away from things made of beans. Little did I know the perfection that is hummus would make such a big impact in my life! If you share the same love, you understand the excitement that rang through me when Cedar's Foods agreed to do a review with me! It all began with an idea and a passion during the mid 1980’s in the Merrimack Valley, about 35 miles north of Boston. Founder Abe Hanna’s passion was for Mediterranean foods. His idea was to put these healthy and great tasting foods into the mouths of everyday American people. Noticing the lack of Mediterranean foods in local grocery stores, the Cedar’s family knew it had a mission to fulfill. Cedar's Foods sent us a few different products to try out, as you can see in the video. They sent Pita Chips, Classic Hommus, Red Pepper Lentil Hommus, Tzatziki and Taboule Salad. A few of these products were new to me, but that didn't stop me from forming a very healthy relationship with them! Love! It is love. Love at first sight! 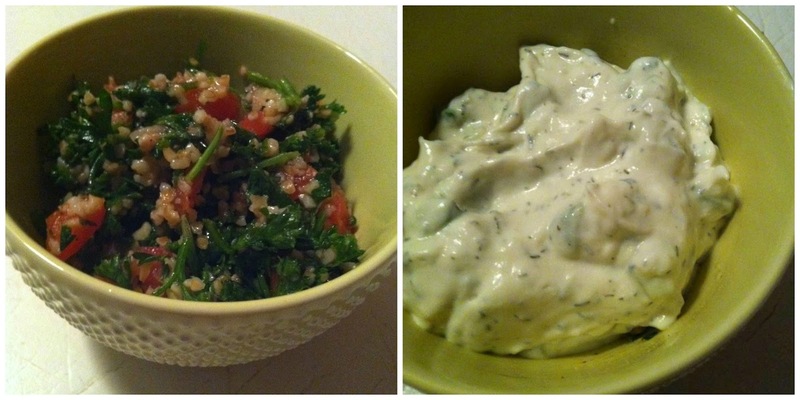 Both Taboule Salad and Tzatziki are new to me. If I had known what deliciousness was about to come out of these tubs, I would have tried it years ago! Taboule Salad is a low calorie mixture of tomatoes, herbs, oils, onions, and Bulgur (cracked wheat). I ate a little by itself and a little with chips. Both ways it was great. This is perfect for a side to go along with a sandwich or even a bigger meal. Tzatziki is a dip made with Greek Yogurt, cucumber, garlic and dill. I ate this with chips and added a little to a sandwich I was enjoying. You could also dip carrots or other veggies right in there and enjoy just the same! Now onto the products I got SO very excited about...... Hommus!! I mentioned above that didn't try hommus until recently. I looked into it as a new thing to eat when I started a Clean Eating diet. Little did I know that I would love it and put it in and on everything! I love the Fiber benefit and the taste isn't so bad either! The Classic Hommus was just that. Classic. The flavor is rich, but enjoyable. I paired it with the Pita Chips (which are rather crunchy and go great with all of these items), carrot sticks and I threw some in a salad. The New Red Pepper Lentil Hommus was a hit in our home too! Red Pepper tends to be the flavor I gravitate to when buying Hummus, so it was perfect that Cedar's Foods asked me to try this one. The flavor is even throughout and went great with veggies, chips and again on salad. I could no find anything wrong with any of the products sent to me by Cedar's Foods. I don't usually look for something, but I did with this company. Every product is just Top Notch! Thank you for making such great food, Cedar's Foods! To get some of your own check your local grocer or find them online! Disclosure: A special thank you to Cedar's Foods for giving Sweet Cheeks and Savings this opportunity to work with them. We received these items free of charge from Cedar's Foods. No monetary compensation was received or offered, nor were we under any obligation to write about this product. All opinions expressed are honest thoughts. We were not offering any sales or taking orders for this item. We will not receive any compensation in connection with any sales of this item. Can't wait to try the Red Pepper Lentil Hommus from Cedar's. Very nice review. Makes me want to try them all. My husband are totally snackers - especially after we put the kids and bed & are catching up on the DVR. We love pita chips & hummus, but I Have never tried this brand. I am going to have to look out for it! These foods sound like they have some delicious flavors. It's nice to try new things once in a while. I've developed an appreciation for beans over the past few years since we changed our eating habits. While plain hummus doesn't do anything for me, red pepper hummus is one of my favorite dips! I've never seen this brand in our locals stores but thank you for sharing. I have never tried this brand before but I love hummus and finding new ones to buy! these look yummy would love to try one of them. I actually love beans, but I don't eat them that often. This dip sounds like just the dip for me! I adore tzatziki with a passion! It's one of my favourite things to dip chicken in; I could live off this stuff the rest of my life and be super happy! I would love to try these, I just checked and they are not in a store near me - hopefully I can order them online without too much extra to ship cold. I love Tzatiki sauce, it is great for salads and we make a tilapia that it goes well with too. I have never heard of this brand! They look so good! I am going to look for them! Ok, hummus and middle eastern foods are some of my favorites. That hummus looks divine and would go great with some yummy pita chips! I always look for products first that are either all natural or organic. They might cost more money, but they are definitely worth it - both for taste and quality.